→ Manages all Enquires Received. → Follow up Details of Enq. Received. → Manages All Prospectus Sales. → Filled Forms Received Back. → Students Daily Activity Management. → Subject Wise Topic Scheduler. → Faculty Wise Subject Wise Topic Allotment. → Auto SMS / Email to Parents. → Faculties Daily Teaching Scheduler Management. → Student Wise Lecture Wise / Class Wise Attendance. 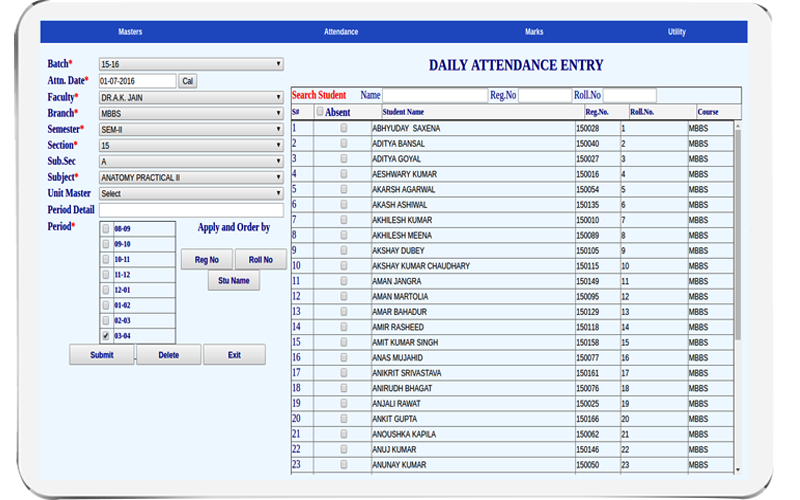 → Student Wise Subject Wise Attendance. → Student Wise Faculty Wise Attendance. → Low / Absent Attendance SMS to Parents. → Faculties can upload the assignments. → Students can download the assignments from any where. → Students can submit there assignments ONLINE. → As per University / College Norms. → As per College Norms. → Books / Journals Master. → Book / Journals Issue Register. → Book / Journals Received Back Register. 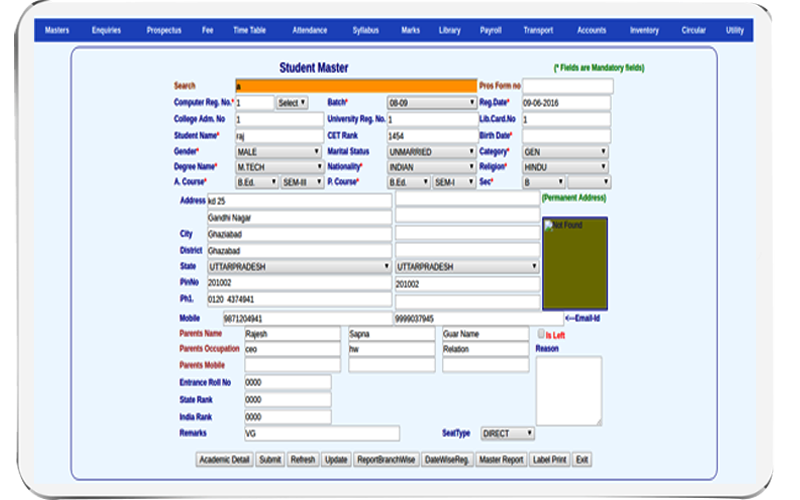 → Student wise Books Issued Register. → Total Issued Book Status. → Employee wise Leave Status. → Employee wise Lone Status. → T.D.S. Status and many more. → Day Book / Cash Book / Bank Book / Journal Book. → General Ledger / Party Ledger / Item Ledger. → Department Wise Item Issue & Receipts Management. → Item wise Inventory Status. → Department wise stock status. 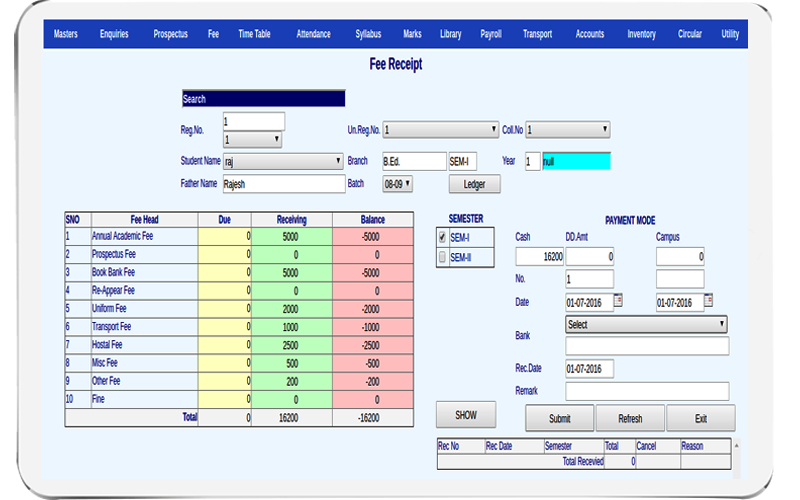 → Profit & Loss and Balance Sheet and many more MIS reports.